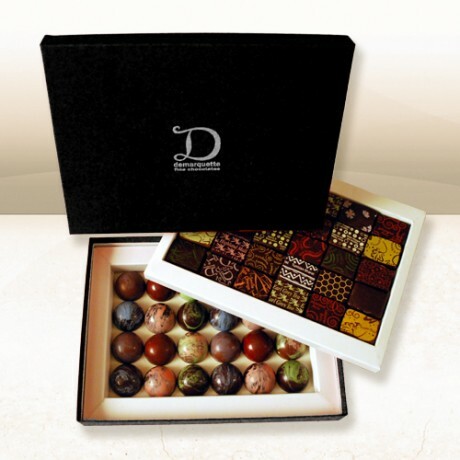 Luxury two layered box with a selection of decadent classic ganache and caramel chocolates. The first layer has 30 ganache and praline chocolates hand selected by award-winning chocolatier Marc Demarquette, made using the freshest cream and real fruit and spices. The second layer has a selection of 24 chocolates filled with a luxurious creamy caramel made with pure Hampshire and Cornish Cream and a variety of exciting flavours. The half sphere-shaped individually hand-painted chocolates are carefully moulded using both our 71.1% house blend and best quality silky Malagasy milk chocolate. Depending on the season and availability there will be a minimum of 9 ganache flavours and 6 caramel flavours in this box. All Demarquette creations are made with only highest quality ingredients. Winning over 50 prestigious awards over the years is a reflection of their consistent quality - you can trust that these chocolates are truly inimitable and exclusive. Due to the freshness of the ingredients this product has a shelf life of two-weeks. Ganache: Dark Chocolate, Milk Chocolate, Cream (MILK), Butter (MILK), Honey. Dark Chocolate: Min 71% Cacao Solids, Cacao Butter, Sugar, Emulsifier: SOYA Lecithin, Natural Flavouring: Mint, Green Tea, Black Tea, Coffee, Spices, Orange, Lemon, Lemongrass, Jasmine, Rose, Coconut, Passion Fruit, Raspberry, Peach, Vanilla, Whisky, White Wine, Ginger, Basil, Cacao Powder. Milk Chocolate: Min 35 % Cacao Solids, Cacao Butter, Dehydrated MILK Solids Min 25% , Sugar, Emulsifier: SOYA Lecithin, Colourings: E171, E129, E102, E110, E132, E142. Colours may cause adverse effects in Children. Caramels: Dark Chocolate: Min 71% Cacao Solids, Cacao Butter, Sugar, Emulsifier: SOYA Lecithin, Natural Flavouring: Vanilla. Milk Chocolate: Min 35 % Cacao Solids, Cacao Butter, Dehydrated MILK Solids Min 25% , Sugar, Emulsifier: SOYA Lecithin, Natural Flavouring: Vanilla. Caramel: Cream (MILK), Sugar, Butter (MILK), Glucose, Citric Acid, Natural Flavouring (Strawberry, Rhubarb, Plum, Raspberry, Apricot, Sea Salt, Fennel, Honey, Rose, Violet, Lavender, Manuca, Elderflower, Carrot, Pepper, Olive oil, Chili, Rosemary, Thyme, Mint, Spices, Coffee, Black Tea, Green Tea, Fig,) Colourings: E171, E129, E102, E110, E132, E142. Colours may cause adverse effects in Children. For allergens see ingredients in CAPITALS. Contains dairy, may also contain traces of nuts and seeds.. Some ganache chocolates contain alcohol.